Cannabis is an annual flowering plant belonging to the Cannabaceae family. The term ‘family’ above, describes one of the lower ranks of the Hierarchy of Biological Classification (scientific classification system) also referred to as the ‘tree of life’. To understand just where cannabis is located within this ranking, we must first understand the ranking system itself. As you can see, Life is at the top and contains all living organisms. Species is the lowest rank. Life: contains all living things and cannabis, being a plant, fits into this category. Domain: Plants and animals are part of the Eukarya domain. One of the three established domains at this rank. Kingdom: Before the new three-domain system, Kingdom was the top rank of the entire classification system. The Kingdom rank contains: Animalia, Plantae, Fungi, Protista, Archaea and Bacteria. Cannabis is in the Plantae category. Phylum: can be thought of as a way of grouping organisms based on their general body plan. Marijuana falls into the Magnoliophyta phylum. Magnoliophyta means flowering plants. This includes flowers and fruit (marijuana is a flower) and plants that have a vascular system with vessels. Class: Cannabis is a part of the Magnoliopsida Class. Magnoliopsida is a valid botanical name for a class of flowering plants. Order: Rosales is an order of flowering plants that include nine families. Aside from cannabis, other well-known members of Rosales include: apples, pears, peaches, almonds, figs and nettles. Family: Cannabis is a part of the Cannabaceae Family. Also in this family are hops, well known for its inclusion in the beer making process. (Cannibus, as a genus had previously been placed in the Mullberry (Moraceae) or Nettle (Urticacae) family, but is now considered to properly belong to the Hemp family (Cannabaceae)). Genus: Finally, cannabis itself, is the name of the Genus. Species: Lastly, we have the Species ranking. Under the cannabis genus, there are three commonly accepted species of Marijuana. 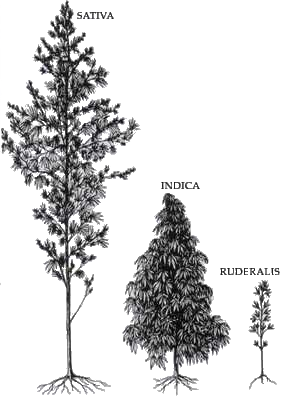 These three species are; 1) Cannabis Sativa, 2) Cannabis Indica, and 3) Cannabis Ruderalis. Most people know of both indica and sativa, however, very few people have ever heard of ruderalis. So, now that we know just where cannabis sits on the ‘tree of life’, lets take a look at the different cannabis varieties/species.